This recipe was inspired from a dish I had at Rent a Chef, a catering company. The caviar adds a surprising touch to deviled eggs. The saltiness of the caviar eggs lends a rich touch to an ordinary deviled egg. Slice hard boiled egg in half length wise. Place yolk in small mixing bowl. To egg yolk add relish, mustard, sour cream, curry powder, paprika, salt, sugar and Miracle Whip. Mix all ingredients until very smooth. Fill eggs white halves with yolk mixture. For that extra touch use a decorating bag and pastry tip to fill egg halves. When ready to serve spoon 1/8 teaspoon of caviar on top of eggs to garnish. 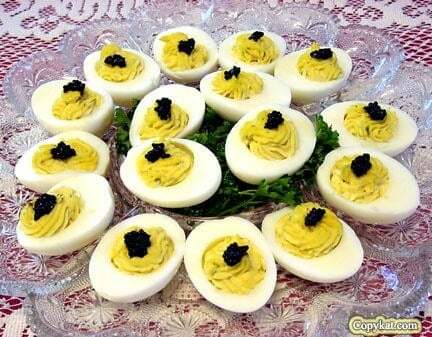 Caviar makes a great presentation and adds that special flavor to these deviled eggs. These were such a fun way to serve these eggs.